What does a Broken Trendline actually means? You are here: Home / Technical Analysis / What does a Broken Trendline actually means? Many of the Traders/Investors those who started reading charts would first like to test their skills with trendlines. They Plot trend lines to identify the underlying trend i.e making them to justifty bull market or bear market. There is basically a wrong assumption prevailing among various traders/investors that a stock/index broken trend line drawn by them means a bearish game to start. The reason is that a break of trendline can be a warning sign that a trend is about to end. This is a dangerous play if you are involved in derivative trades and taking decision based on such assumtions. such kind of trades will change the trading mentality of traders/investors in taking decision. For example just look at the picture below. A stock/Index could have broken a trendline but still be making higher peaks and troughs, as in the chart below. What trendlines actually show is the rate of change of a trend, not the actual trend itself. In the example above, the trend is still up but the trendline break means the trend is slowing down. And now the accelearation of a particular stock/index price is very less when compared to the earlier acceleration speed. 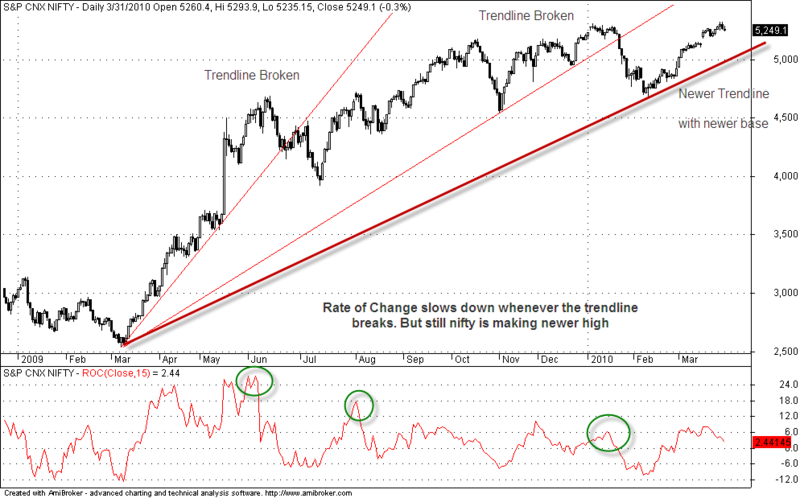 From the daily nifty chart you could see that ROC (Acceleration speed of price) slows down whenever the trendline breaks but still nifty is busy in making newer high. Trendlines should be used as a trailing stop loss for your trades or invesment to protect your self from the risk. But relating a broken trend with the Bear market will result in false decisions in most of our trades. Is Divergence a Trustable trading Indicator? good observation and information. i think the trend line break down should be confirmed by lower low to confirm trend. good observation but i started to draw regression line define trend.